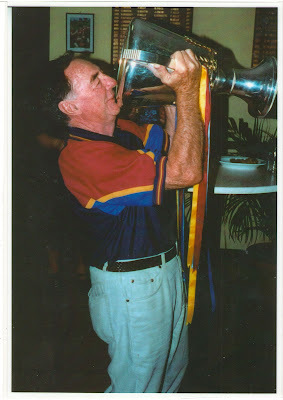 When I saw that the Coolum open tournament was named the " Bill Powell Open" I assumed my old mate had passed away. The "news" saddened me and memories of good times flooded my brain. I met Bill in the early nineties when I first went to play in the Coolum open and other tournaments in Queensland. Back then there were many, well organised with large prize funds and large fields. Bill sought out and obtained sponsorship, contacted the press for publicity and contacted top players to attract them to the tournaments. Amongst the many things Bill did for chess was creating the Australian chess directory. 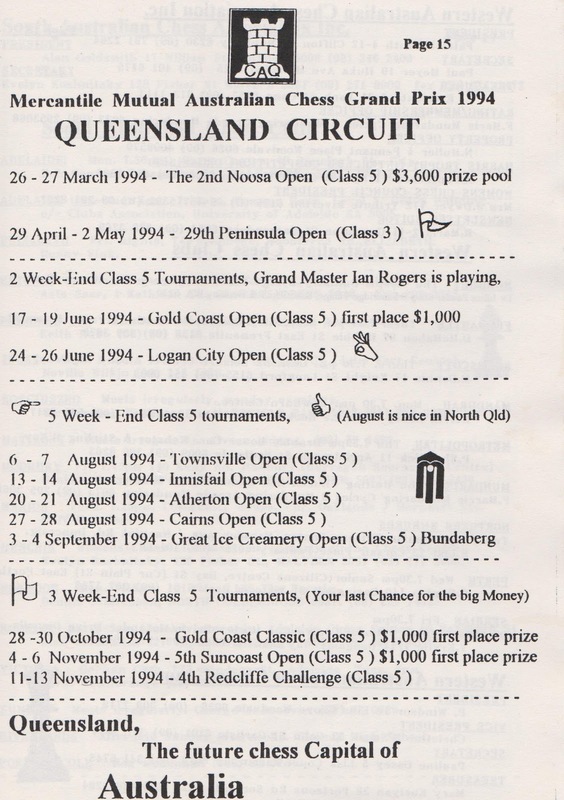 In it were the contact details of every chess club in Australasia that Bill could find as well as tournament listings, office bearers of state associations, chess correspondents and any other relevant information. 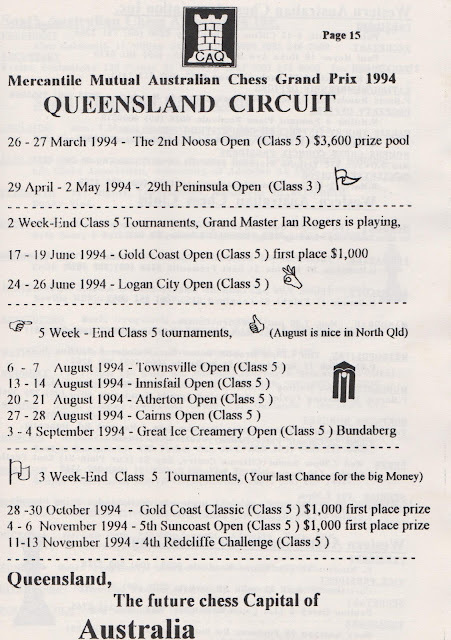 Here for example was a listing of the tournaments in Queensland in 1994. For you young people keep in mind that all this was done without a computer! A lot of work was involved especially since many people refused to share information for one reason or another. Compare this to our current calendar if you can find it. 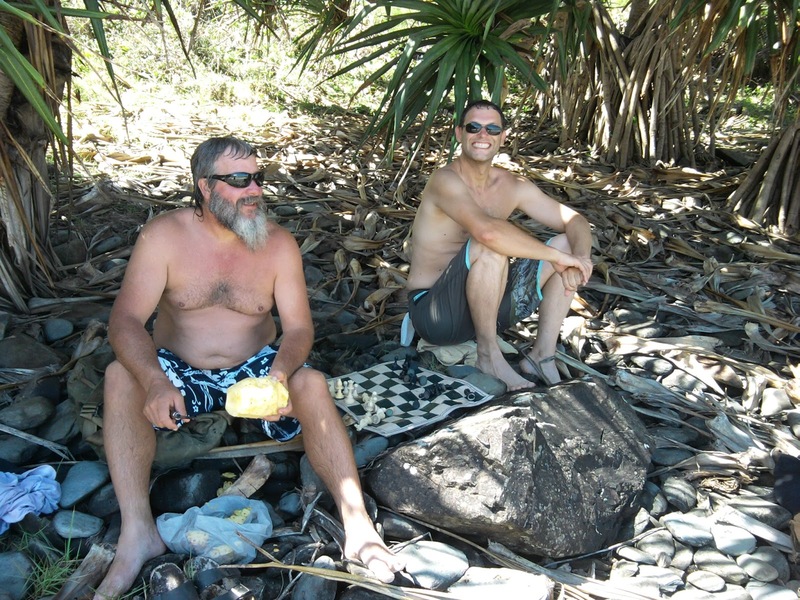 Let me give you the link to the Chess Association of Queensland and see if you can. Enough complaining, at least its better than the ACF website but that is not a high bar to jump over. So this weekend I drove up to have a look and who do I see? Bill Powell, large as life. 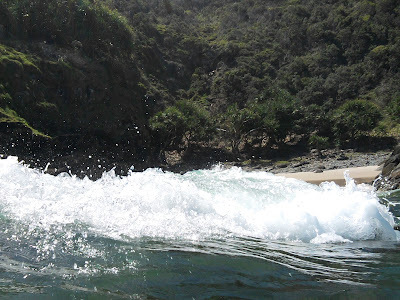 A wave of joy swept over me and before thinking I blurted out "Bill, you're alive!" He was glad to see me too and immediately invited me to spend the night at his place. This is an offer one cannot refuse especially since one is guaranteed a feed by his lovely wife Maxine. As it turns out Bill runs the Coolum Perigian RSL club where the tournament is held. 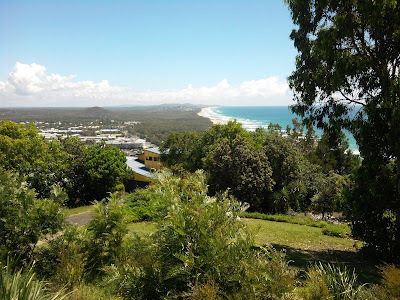 On Sunday Bill took me for a drive around Coolum for a bit of sightseeing while the rounds were on. If you have never been to the Sunshine Coast this is what you are missing out on. 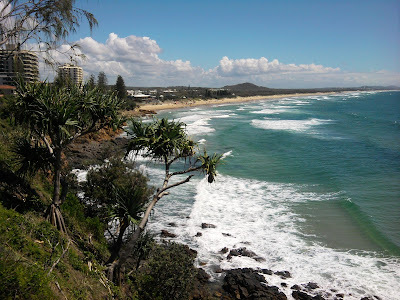 The un-patrolled beaches south of Coolum. Apparently people who dislike swimming garments can frolic here without fear of repercussions. 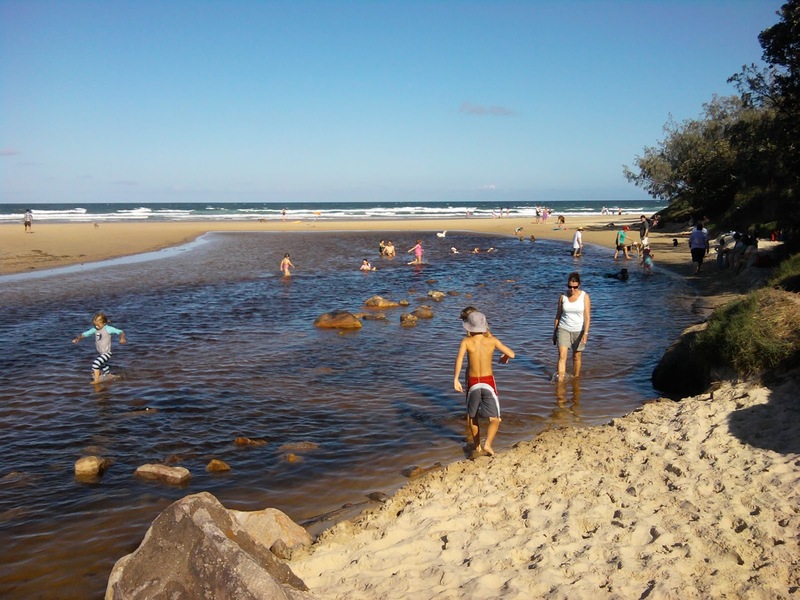 Stumers creek, a child and dog friendly are near the venue. The tournament was a turkey shoot. GM Roland Schmaltz who has been living in Brisbane for 7 years won with a picket fence 6/6. At the prizegiving he bade us all farewell as he is returning to Germany soon. This is a shame because we could use a strong GM around to encourage our juniors. Unfortunately the chess community has done nothing to "exploit" this natural resource. As unbelievable as it sounds we have people teaching children who don't know the en-passant rule and yet Roland currently has one (!!) student. Anyway, back to the tournament. Roland playing Gold coast talent Jonas Muller who put up a good fight. Second was Denis Ovcina, a player unknown to me. I saw him outplay Steven Solomon in the last round and steadily grind him down in an ending. Then like in many of Stevens games, a higher power intervened and Steven drew despite being a rook down. 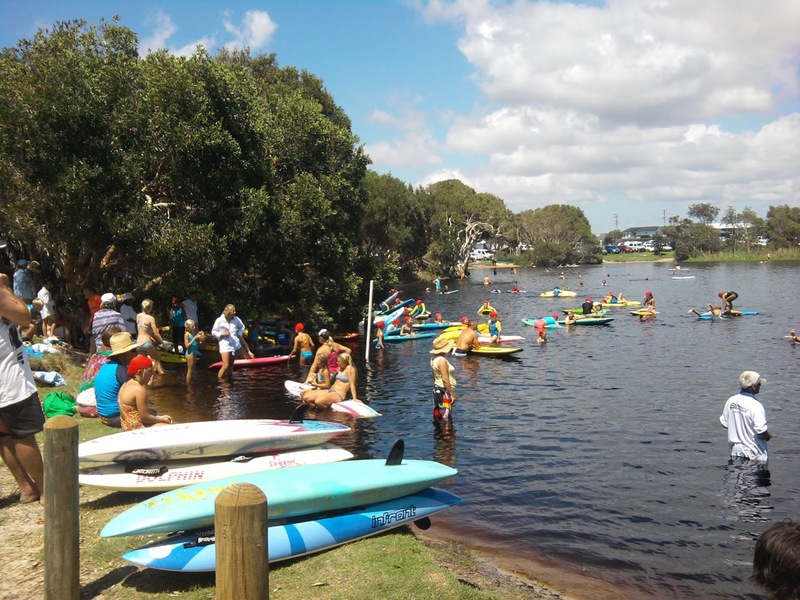 Jonas finished equal third on 4.5 with a group of people including Steven and another 2 Gold coast Juniors, Gene Nakauchi and Martin Jack. Gene v Daniel Lapitan in front and John Harris playing white against author Kevin Casey in the back. 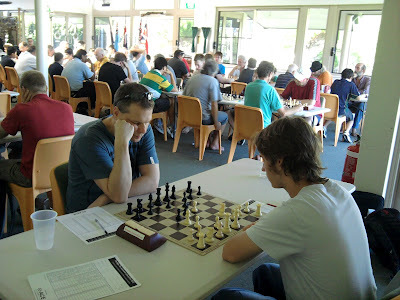 I did play some chess on the weekend. Saturday night they had a blitz tournament where I tied with Steven Solomon for 1st. Woohoo! The tournament is now run by a capable young man by the name of Jeff Dyer. He is well supported by Bill and constantly asking how he can do things better. 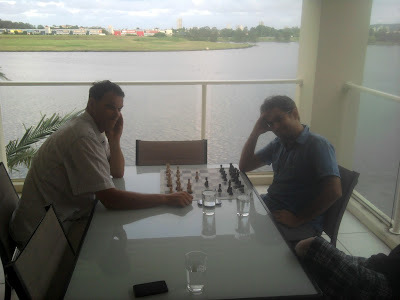 Although he has big shoes to fill I am sure he will bring chess back to prominence on the Sunshine coast. 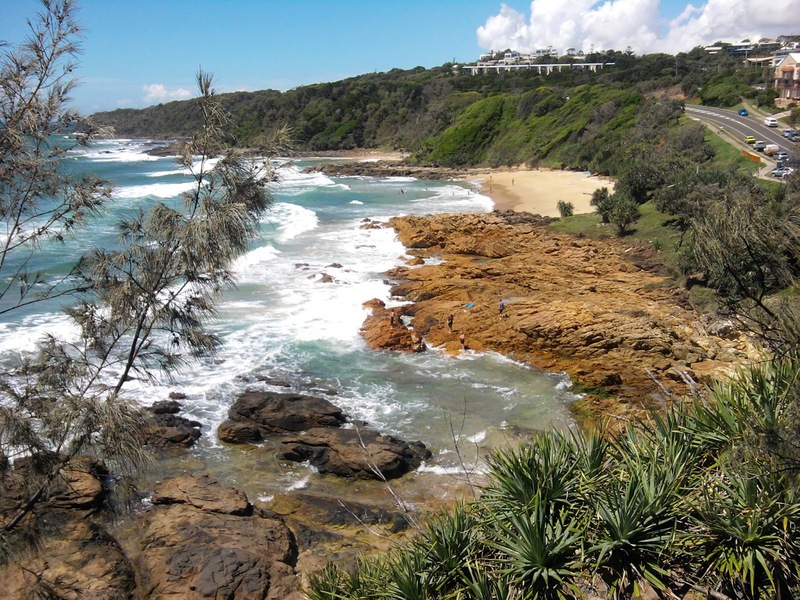 As for Bill, now we have exchanged numbers I am sure I will be visiting beautiful Coolum beach more often. 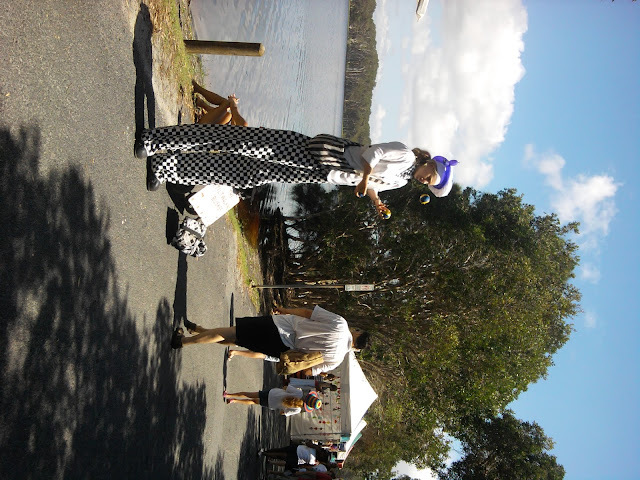 The next event on the Sunshine coast I am aware of is in November 24-25 in Caloundra. The website is here. No details yet so let me know when it's done guys. Don't measure your performance by the ACF. Oz is indeed a land of wonder. Standing on the corner in Broadbeach we had the choice of several good restaurants, a Japanese, a Thai, an Italian but we chose an Indian, the Saffron. If Australia survives 2012 we will be like Noah's Ark. A taste of every culture on Earth. left to right: my arm, Peter Happy, David Esmonde, Annette Caoili, Levon Aronian, 3/4 of Sergei Movsesian. It was at the Saffron that we saw off our Armenian friends Sergei and Lev. Noticing the lack of Armenian restaurants in Australia they are now going to an undisclosed location to open one up. Lev also used the opportunity to sharpen his game by training with Gold Coast IM Peter Happy. Without a chess clock you say? Au contraire mon ami! If you look closely you will see a mobile phone behind the glass of water. If you have an Android phone you can simply download the Social Chess app and blitz away. Our training methods here are unique. Pineapple, beach and uneven surface. Once you can play on rocks a table is a piece of cake. I was feeling "artistically inspired" on this day. 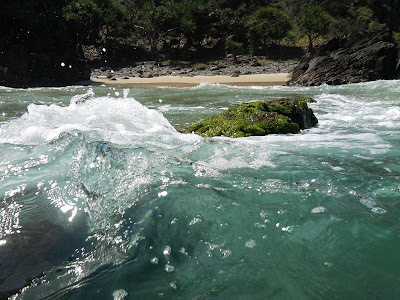 While local Guru Justin was updating Peter on the "Rocky Cove Gambit" I thought I'd take some pics from the surf. Unfortunately I forgot to heed the words of my favourite song from my currently favourite band "Never turn your back on the Sea"
Next week I'll tell you if Samsung mobiles are salt-water resistant. 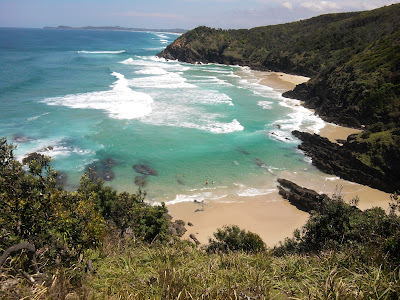 If you too want to visit Whites beach just take the Broken Head Rd, turn right at the 7 mile beach sign and park at one of the un-signposted parking spots on the dirt road, take the track that looks like it leads nowhere and hope its the right one. Or if you know Justin ask him. Whites beach was however only our second swim of the day. Our first was at Lake Ainsworth near Lennox Heads. 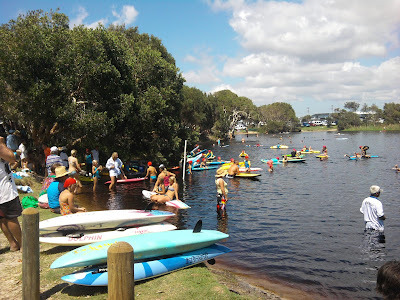 Lennox markets are nestled between the beach and the lake. While we were swimming a busker was playing Spanish guitar in the background. Magic. Leaving the house is not a problem. When you have Giant Kookaburras guarding your house you've got nothing to worry about. That is not a miniature tractor! And at night the specially trained Guard-roos look after the house. Here an adult is training a Joey. That's all from the wonderful land of OZ for today. I will not play mainly because titled players are not "encouraged" but might go as a journalist. 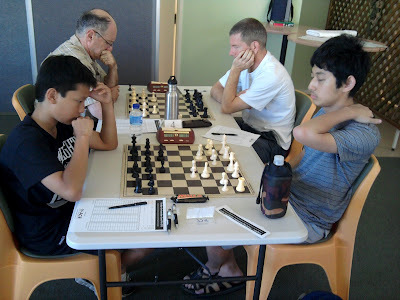 Last year about this time, after the Tradewise Gibraltar Chess Festival I posted a rant about the Australasian Chess Crisis which touched on women's chess. A lively debate followed in the comments section where I made the following prediction. "Anyway the young girls playing top level chess are getting better and better now and soon our conversation here will seem antiquated. In the next few years when Ho Yifan and her contemporaries rip the arms and legs off their male colleagues, girls will be inspired to do the same". Never miss an opportunity to gloat! I must admit however that I never expected that my "prophecy" would come true less than a year later. Women's World Chess Champion Hou Yifan has tied for first in the 10th Tradewise, Queens Diamond Jubilee, Gibraltar Masters Open. play-off for the title. Nigel Short climbed that mountain by beating the higher rated Krishnan Sasikiran with black. He then ruined the script by winning the two game rapid play-off. GM Simon Williams added that extra touch with his Video commentary. Many players joined him every day to show their games or comment on games still in progress. There are many hours of the best, most entertaining chess lessons you will ever get and all for free. I hope you leave it up there a while, and yes, I am talking to you Stewart Conquest! Long time readers will remember this post and I hope you remembered it for Nana Dzagnidze's masterpiece. She started like a rocket but then got slowed down a little by the 2700 gauntlet she had to face. Look at what she did to this poor unsuspecting 2600 GM. Lastly I must mention my celebrity guest ranter from the aforementioned post, Arianne Caoili who just won the Tata steel Tienkampen 2B round robin. Unfortunately I cannot find her games on the site, which btw could learn something from Gibraltar, and she has not sent me the pgns yet as requested so I cannot show you any games. It seems all three ladies have gotten the "Doubleroo bump" Have a nice weekend! I first met Phil in 1993. 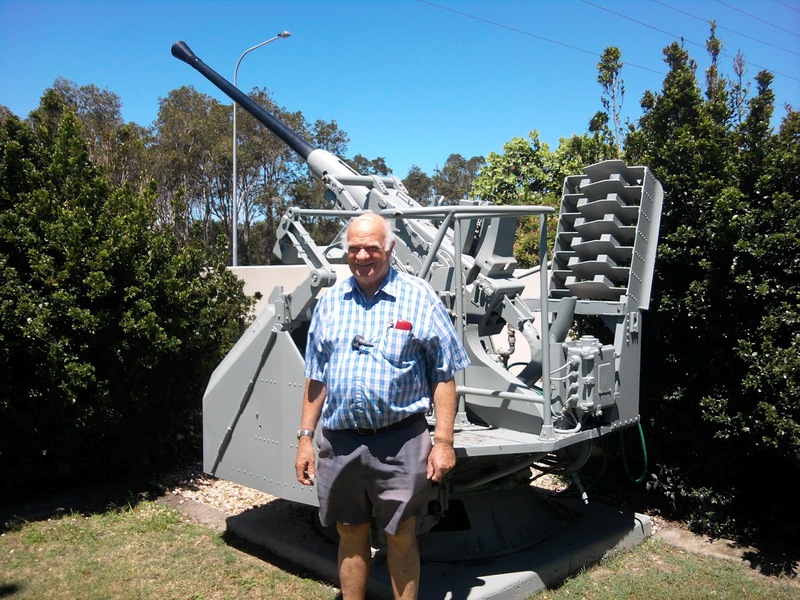 His son David was then president of the Gold Coast Chess Club and was mainly responsible for my move from Adelaide to the Gold Coast. They were then living in Paradise Point and I visited frequently in those days. I clearly remember Phil inviting me in whether David was home or not, offered me a beer and we would chat even if the football was on. Only as I got to know him better did I realize what a sacrifice that was. 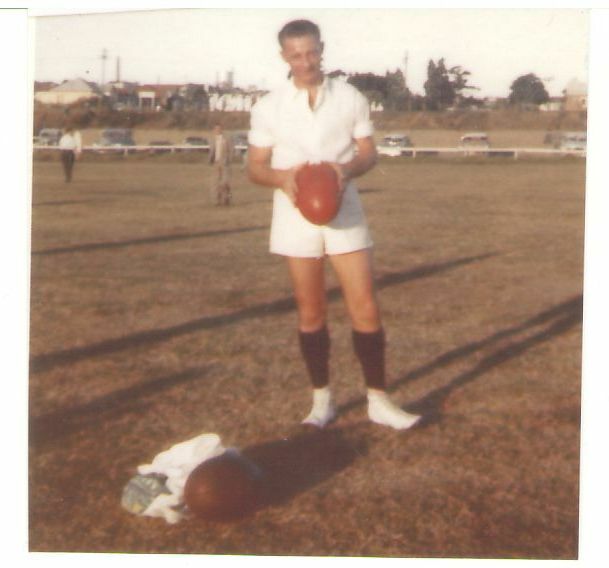 He loved his footy and even umpired three Premierships. He got several prizes for fairest and best Umpire. 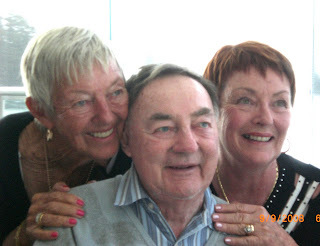 He passed away peacefully last Wednesday evening at the age of 82. Today his family and friends met to say goodbye. Below is a short Video that was played at the Funeral. The photos start after the first song so please be patient. You will be rewarded by an impression of the life of a real Australian from another era. I feel privileged to have known you Phil and thankful for the things you taught me by example. One of those things is that you can say a lot with few words. I'll have to put that into practice one day :) Where ever you are now there is one thing I am sure of. Whoever is there is glad of your company.